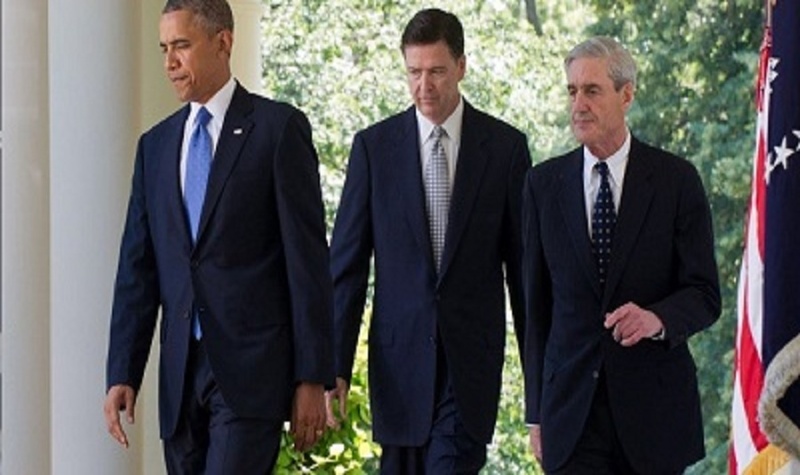 Photograph: Left-to-right: Former President Barack Obama; Former FBI Director James Comey; and Special Counsel (and Former FBI Director) Robert Mueller. Said by many Americans to be three of the most dishonest and narcissistic politicians in the D.C. Swamp. 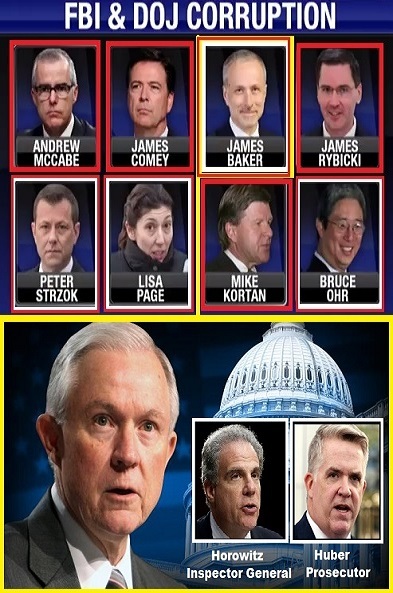 The eight photos at the top are FBI and Justice Department politicians who make J. Edgar Hoover look like an altar boy. On Friday, a government watchdog reported that it had obtained disgraced and fired Federal Bureau of Investigation (FBI) Director James Comey’s emails containing sensitive government information from his non-secured Google Gmail account. The latest revelation adds to proof of an Anti-Trump conspiracy and cover up at FBI. The watchdog group, Cause of Action Institute, reported that it got the documents from the Federal Bureau of Investigation through an ongoing Freedom of Information Act (FOIA) lawsuit. The lawsuit was initiated when the FBI and Department of Justice failed to comply with the original FOIA applications. The first of the FOIA document productions, the Comey email records, are just the start of uncovering the true nature and extent of Comey’s use of private email to conduct federal law enforcement business that put classified information at risk of being intercepted by hackers from other nations or crime gangs. Ironically, this is the exact charge made against former presidential candidate Hillary Clinton when she served as Secretary of State. And she got off Scot-Free. “The problems associated with using personal email for government work are obvious, but those caught in the act often try to act as if they had no idea they were doing anything wrong or they justify their behavior as merely incidental,” stated CoA Institute officials in their report. CoA Institute first addressed the problems that resulted from government employees using private email for official business in a 2012 journal article: Gmail.gov: When Politics Gets Personal, Does the Public Have a Right to Know? In the years following the publication of that article, CoA Institute has revealed how upper-echelon government officials can use personal email accounts or messaging apps for government business to sidestep transparency and avoid legal or disciplinary action for transgressions. “Government overreach cannot be fought effectively if the process and enforcement are kept in the dark. That’s why CoA Institute is committed to holding the government accountable to transparency laws and has brought cases to uncover the private email use of officials such as former Secretary of State Colin Powell, former Secretary of State Hillary Clinton, and now, former FBI Director James Comey,” CoA Institute official argue. CoA Institute had submitted FOIA requests to the Federal Bureau of Investigation (FBI) and the DoJ’s IG to obtain copies of that email correspondence agencies failed but the agencies did not respond to the requests in a timely fashion. The FBI provided its first rolling production late last week. You can read and download the documents here. “The FBI reviewed 526 pages, but released only 156 pages, and withheld 370 pages in full. The FBI also withheld seven emails under the FOIA’s law enforcement exemption, which applies only where the government can show that (1) a law enforcement proceeding is pending or prospective, and (2) release of information about that proceeding could reasonably be expected to cause some articulable harm,” the officials at CoA Institute argue. But those seven of the messages were deemed so sensitive by the Sessions Justice Department that they refused to release them. The obvious stonewalling by the FBI and the lack of transparency by the Attorney General Jeff Sessions — who was Trump’s man at that time, but was fired last week — are particularly troubling given that Director Comey told the IG he only used personal email “to word process an unclassified [document] that was going to be disseminated broadly, [such as a] public speech or public email to the whole organization.” And according to news reports, the man Trump labeled ‘a liar and a leaker,’ “Comey stressed that his personal email was never used for classified or sensitive work,” which is a lie. The e-mails records released to CoA Institute show that Director Comey was aware that his use of personal email for government business would be seen as “embarrassing” to anyone who wasn’t aware of it previously.